Arnfinn and I ate cake in a most amazing living room yesterday.Our neighbors have transformed their indoor swimming hall to a living room extraordinaire. The high-vaulted ceiling added space and light, there were large windows, even a lovely bay window, two large chandeliers, and beautiful large paintings. Two of my own painting hung there, too. As we walked home on the cold, crisp snow I told Arnfinn that we needed a room like that to accommodate our large family for Thanksgiving, Christmas, and days like that. "I think we should build an addition like that onto our house," I said teasingly. "You just need to sell a lot of books first," he replied, flashing the boyish smile that I love so much about him. Oh, well--it's great to dream. Without dreams, how can dreams come true? For now, I truly enjoy our quaint little living room with old and new furniture, paintings by my dad and myself, Russian matryoshkas, my collection of witches, Poppy the parakeet, and a cozy fireplace. Suits us just fine, but if we can come and eat cake with the neighbors now and then in their beautiful high-ceiling room, that's great too. 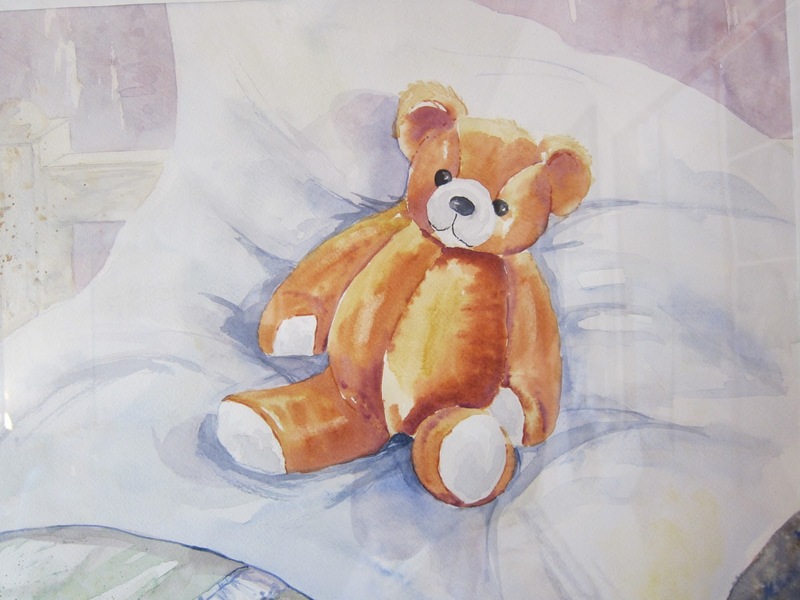 I'm tired today and today's water color shows a cute teddy on a soft pillow. Looks wonderful, tempting.